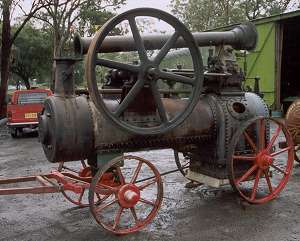 Other Paxman Portable pages on this site are ones giving details of several surviving engines in the UK and Overseas except Australia and another with probably the most comprehensive listing available anywhere of known surviving Paxman steam portable and traction engines. Many Davey Paxman steam portables have survived in Australia for two main reasons. First, they were exported to Australia in large numbers. The businesses of the Intercolonial Boring Company (IBC) and John Blyth / Moffat-Virtue Limited provided a steady stream of customers. 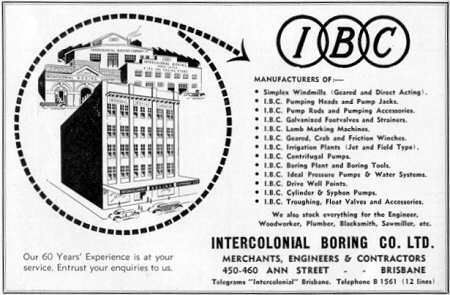 IBC operated a large number of water drilling rigs all over Queensland and Northern Territory as well as a considerable merchant business in hardware and machinery. Every bore that IBC sunk needed pumping plant which in turn required an engine to power it. Many of these bores are still in use albeit with more modern prime movers. Moffat-Virtue Limited, which had branches in Sydney, Adelaide, Melbourne and Toowoomba, were major suppliers of overhead shaft gear, especially for woolsheds, and customers needed engines to drive such gear. The second key reason so many old portables have survived in Australia is the hot dry climate. They have suffered far less rusting and corrosion than machinery exposed to the British climate. The relatively good condition of some surviving Australian portables appears to attract the interest of dealers looking to profit from prices available in overseas markets. 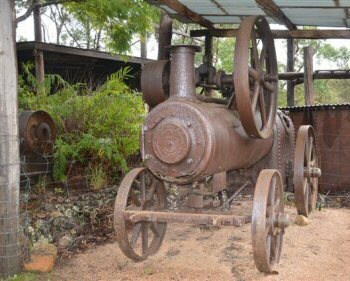 This is a sensitive issue to preservationists in Australia who naturally wish to see historic machinery retained in their own country. We therefore take this opportunity to draw the attention of dealers and potential overseas purchasers to the Protection of Removable Cultural Heritage Act 1986. 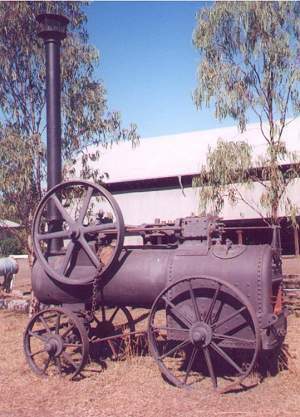 Under this legislation machinery like an old portable steam engine may require an export licence before being shipped overseas. Anyone planning to export an item which may come within scope of the Act is advised to seek professional advice at an early stage. There are penalties attached to exporting in breach of the licence requirements. Below are details of several surviving portables in Australia. It would be good to identify the first engine listed here. If you can help with its number and/or present location please contact me. The engine number is usually stamped on the end of the crankshaft but may be obscured by paint or rust. It may be necessary to use a wire brush before the five digit number (usually between 15000 and 20000) can be read accurately. Unidentified This portable was advertised for sale in late 2003 as a 12hp, 1913, twin cylinder engine. The address of the person to contact was given as Cowra, NSW, but attempts to make contact have so far been unsuccessful. Unidentified (possibly 19031) A portable on display at the small museum of the Northern Territory Power & Water Authority (PAWA) at Darwin River Dam. The engine was brought to our attention by John Wilson who was involved with it in the mid-1980s when he was working for the Department of Transport and Works in Northern Territory. At that time the portable was recovered from a cattle station near Tennant Creek and partially restored by some of his apprentices. The firebox was unserviceable and all the bearings and brass fittings were missing. The cylinder was freed up and some white metal bearings poured and turned. Various gauges and valves were procured which were representative of the original. The unit was painted and run on compressed air, the friction from the piston actually burning some of the injected oil which produced smoke. 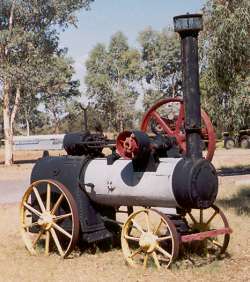 The engine was exhibited at the Darwin Show where it attracted a good deal of attention. PAWA, the present owners, have looked for a number on the engine and found one stamped on the flywheel. This is where, in the absence of the relevant brasswork, one would expect to find the engine number. The number they have found looks like 11031. In the Paxman order book No 11031 is a totally different type of product, not even a portable, ordered and made in 1901, well before any other known portable was exported to Australia. It regularly happens that numbers stamped on old Paxman engines are difficult to read because they are partially obscured by rust and/or paint. If the second digit is a 9, not a 1, then we may have an answer to the puzzle. No 19031 was a portable and was ordered by the Intercolonial Boring Co of Brisbane on 14th May 1915. It was a 7NHP engine of 9¼" bore x 12" stroke and despatched from the factory on 2nd July 1915. No 19031 was one of an order for 10 portables, of differing outputs, placed by IBC on 14th May 1915. PAWA plan to look again at the number on their engine when time permits. No 14028 The oldest known surviving Paxman portable in Australia, this 4 NHP engine, with a cylinder of 7" bore x 12" stroke, was ordered on 5th September 1906 by Francis, Chapman Deeks & Co. Orders for four portables were placed by them on that date, the others being a 5 NHP engine (No 14029) and two 6 NHP engines (Nos 14030 and 14031). No 14028 was despatched to Brisbane on 16th January 1907. The smokebox door carries an 'Intercolonial Boring Co, Brisbane', agent's plate and initially it was a puzzle as to why the name of the customer recorded in the order book was different. Andy Moran, who once owned the engine, found the answer. Francis Chapman Deeks & Co were "Colonial Merchants and Shipping and Insurance Agents" with offices in Fenchurch Street, London and in Sydney. It seems fair to conclude that the Intercolonial Boring Co placed the order for the engine through Francis Chapman Deeks & Co who acted as its UK agent. The engine was originally purchased by Mr Peter Jeffrey, who was born in Scotland in 1841 but emigrated to Australia with his father who had left the British army. Mr Jeffrey owned Mingoola Station, on the Queensland - New South Wales border from 1874 until his death in 1922. The portable was used to pump water to irrigate tobacco crops but the area is subject to severe flooding and the engine was almost buried in the riverbank before it was finally recovered. In 2018 the engine was purchased by Ian Lovi of Maitland, NSW, from Andy Moran who had owned it since 2014. Before that it was owned by Rob Turnell of NSW who acquired it no later than July 2011. When Andy acquired the engine he told me it seemed structurally sound and that he planned to restore it. Sadly, as is not unusual with old Australian portables, all the brass work had been stripped off the engine so a new governor, boiler feed pump and gauge glasses were needed. No 14802 This 8 NHP engine, with a cylinder of 10" bore x 12" stroke, was ordered on 3rd June 1908 by James H Craven. Judging by the number of similar orders from this source, one assumes Craven was a Paxman agent at the time. The engine was despatched to Melbourne on 29th June 1908. As can be seen from the picture, No 14802 looks very smart after restoration. It is steamed from time to time and, although not shown in the photograph, does have its chimney. No 14802 was owned by the late Laurence Martin of NSW who died in May 2004. The private collection he built up contained a number of other interesting traction, ploughing and portable engines of British manufacture. As yet we know nothing about the previous history of the engine so any information would be welcome. No 15443 In December 2001 I received an email from David Macloy, of Laura, in the Flinders Ranges of South Australia. 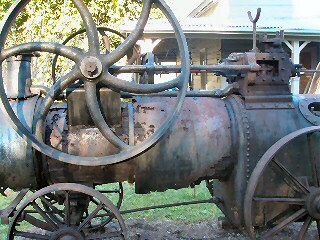 David had just taken on looking after this portable which belongs to the Booleroo Steam & Traction Preservation Society. It had previously been stored for some thirty years by the Society after being acquiring from Hesso Station, a one hundred odd square mile sheep farm about 220 miles north west of Adelaide, where it was used to drive the shearing shed. The boiler has suffered badly from corrosion and most of the brasswork is missing but some of the paintwork is still visible - see the Colour Scheming section below. In early February 2002, David reported that the engine had been freed and ran quite happily on compressed air. The steam chest and cylinder had been preserved with a special grease that turned out to be mutton fat which had been used as cylinder lubricant (readily available on a sheep station!). That didn't leave much more than to clean and adjust the brasses and cross-head guides. Unfortunately the fire-box crown and the bottom 6 inches of the fire-box surround have rusted out. Dropping the fire-box and replacing half the boiler would be very costly so No 15443 may have to be restored as a stationary exhibit with the hope that the boiler can be repaired some time in the future. In February 2003 we received an update about work on No 15443. It had been stripped down to a bare boiler and wheels and David was slowly getting it cleaned back and undercoated. However, with daily temperature often over 40C for the previous couple of months it was just too hot to work in the shed, even at night. David was slowly getting a clearer picture of the original colours - the engine and the crank-shaft brackets were black with red lining, not basalt as first thought. The grey colour he could see on the fly-wheel was now thought to be only the filler/primer used to smooth over the casting before the top coats were applied. Unfortunately there is no trace of the top coat left to show what colour it was. One intriguing thing was that the number 534 kept turning up in white paint, under all the other paint and it's on all the mains parts like the fly-wheel, cross-head guides and cylinder casting. By coincidence, a couple of days after receiving David's update, Peter Love emailed to say he had found the number 534 on the big end bearing of his portable. In February 2004 David emailed more information about numbers found on No 15443. The engine number itself appears on the Paxman plate on the smoke-box door, the crankshaft, and its gib-head key. 9414 appears on each end of the axles and we do know this is the order number for the engine. WK.7965 is stamped at about two o'clock on the radius of the backhead and 8747 directly over 7965 above the fire-door. (Two different numbers appear over the fire-door of No 12982.) If anyone has an ideas about what 534, WK.7965, 8747 or 7965 might refer to, we would all be interested to hear. None relate to part numbers in the spares catalogue, but one or two may be drawing numbers. No 15526 A 4 NHP portable, of 7" bore x 12" stroke, built under Paxman Order No 9498 of 2nd June 1910. Ordered by John Blyth & Co, it was despatched to Sydney on 20th September 1910. In September 2014 I received an email from Gilbert Eastwell saying he had acquired the engine in September 2013, from Quirindi, NSW. When acquired, it was totally complete except for tools that might have been supplied when new. Much of the original paint and pin striping is still visible. Gilbert restored the engine to running order in January 2014. Not much work was required to achieve this. The feed water pump piston was stuck, along with the governor and the piston rings. A new piece was welded in the bottom of the smoke box. One smoke tube was blocked off, presumably because it had a leak. A small amount of work was done on the boiler before pressure testing up to 90psi. By September the engine had been steamed several times but the process of cleaning the boiler was ongoing as much scale had built up, due to washing out having been neglected for many years. Now kept near Toowoomba in Queensland, No 15526 is known to have spent the end of its working life being used to produce steam for a honey factory. No 15643 On 27th April 2002 an email was received from Steve Parrinder with a photo, shown on right, of No 15643, which had just been sold at auction. From the agent's plate on the smokebox door we know this is another portable that was ordered and imported by the Intercolonial Boring Co of Brisbane. The order book entry is not entirely unambiguous. No 15643 could have been built under either Order No 9614 or 9619, both entered 1st September 1910. The engine is a 12 NHP double cylinder portable with each cylinder of 8¾" bore and 12" stroke. In April 2005 an email was received from Geoff Dunnett who had just purchased No 15643. Geoff, who lives south of Brisbane, reported that the boiler is in excellent condition, with only a small amount rust in the base of the smoke box. The engine has done very little work in its life and some of the original paint pinstriping can still been seen. Unfortunately, like several other surviving Australian portables, many of the brass items are missing. However the previous owner has had the majority of the missing parts cast, half of which have been machined. No 15687 In late January 2006 Tony Marvin sent photographs of this 3 NHP engine which he had recently seen in New South Wales. No 15687 was ordered by John Blyth & Co, Sydney, in October 1910 and despatched from the factory on 25th November that year. It carries a Moffat Virtue agents plate. The photographs show the engine is badly weathered but still has its motion and flywheel. No 15775 In September 2002 David Macloy emailed this photograph (left) of No 15775. It was taken by his parents while on holiday in St George, Queensland. The engine was donated to the people of St George in the early 1960s by Mrs Agnes Andrews whose first husband, Paddy Tebb, owned it. Mrs Andrews thinks it may have come into the area about the 1920s as they had an orchard and small crops business there. 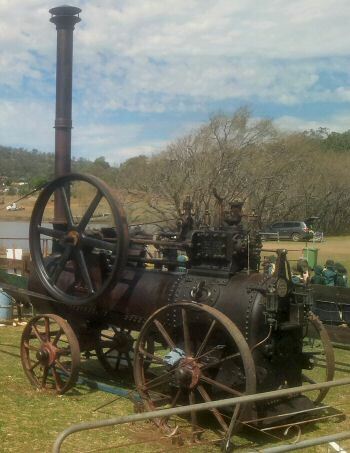 The engine was used on the Balonne River for many years where it powered water pumps supplying the house and garden. In the early 1960s the St George Apex Club laid out parks along the town's river front. The engine, then in rather poor condition, was placed here and the town's children played on it for thirty years. 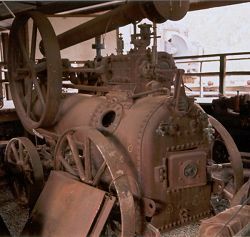 In the early 1990s the Apex Club was encouraged to restore the engine to working order, after which it was placed in the museum yard for safekeeping. It has been steamed on a few occasions but the feed water pump is in need of repair. As at February 2003 there were plans to build a lean-to on the old gaol house where the engine, which needs repainting, can be stored with a large wagon also awaiting restoration. The Paxman order book records that No 15775 is a 5 NHP portable with a 7¾" bore and 12" stroke. Ordered by John Blyth & Co of Sydney on 13th December 1910, it was allocated Order Number 9747 and despatched from the factory on 6th March 1911. No 16942 A 3 NHP single cylinder engine, of 6½" bore x 10" stroke, No 16942 was built under Order No 10914, and despatched from the Colchester factory on 3rd November 1911. It is another of the 34 portables ordered by John Blyth & Co of Sydney, the orders for which were entered in Paxman's Order Book on 10th March 1911 - see notes on No 16916 above. Photo: No 16942 as at late 2018 or early 2019. No 16950 A 4 NHP single cylinder engine, of 7" bore x 12" stroke, No 16950 was built under Order No 10922, and despatched from the Colchester factory on 22nd September 1911. Like Nos 16916 and 16942 above and No 16956 below, it was one of the 34 portables ordered by John Blyth & Co of Sydney, entered in Paxman's order book on 10th March 1911. The engine bears a Moffat Virtue agent's plate and is believed to have been found near Ardlethan in southern NSW. 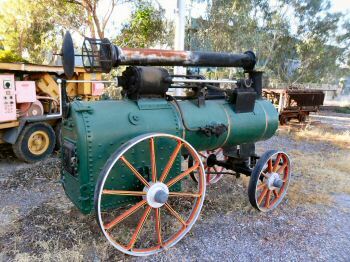 Owned by John Ulner, the engine is on loan to the Port of Echuca Museum on the River Murray, Victoria, where it is an unrestored display item. Fitted with a Pickering governor, No 16950 is reported to be pretty complete but from photographs it appears the water pump and rod may be missing. The boiler is known to be in need of re-tubing. No 16956 In April 2002 an email was received from Andrew Provan of Colac, Victoria, about 180 miles south west of Melbourne. Andrew had just acquired No 16956 which he reported to be in full working order. The engine came from near Grenfell, NSW, about 160 miles due west of Sydney. From what Andrew could gather, it was used in a shearing shed in the Grenfell district before being sold and taken to Sydney to work at a boys home (doing what Andrew knew not!). After a stint there it was purchased by its last owner who took it back to central NSW. The engine has never been stored in the open and is consequently in exceptional condition. The pinstriping is still on the bearing brackets and polished steel parts are still bright under the grease. The engine had an injector fitted and the pump had a bad crack in it which has been repaired. The injector has now been removed, restoring the engine to its original state. Apart from some pitting in the firebox crown, the boiler is in excellent condition including the tubes except for one with a pinhole. No 16956 was another of the 34 portables (see 16916, 16942 and 16950 above) ordered by John Blyth & Co and entered in Paxman's order book on 10th March 1911. A 6 NHP Single Cylinder Portable of 8¾" bore and 12" stroke, No 16956 was built under Order No 10929 and despatched from Colchester on 3rd July 1911. No 17119 One of a batch of nine portables ordered by John Blyth & Co, the orders for which were entered in Paxman's order book on 27th June 1911. The orders (Nos 11088 to 11096) were for three each of 3, 4 and 6 NHP sizes, covering engine Nos 17116 to 17124. At least two other engines of the batch have survived, Nos 17122 and 17124 (described and pictured below), and possibly another, No 17123. All were sent to Sydney but only the first order entry (for No 17116) has a despatch date beside it, 19th September 1911. No 17119 was built in 1912 and carries a Moffat Virtue agent's plate. No 17119 is a 4 NHP single cylinder engine of 7" bore x 12" stroke, now on display at the Kerrisdale Mountain Railway and Museum, Victoria, owned and run by Andrew and Jennifer Forbes. Andrew says the engine is in amazingly original condition and has been very well looked after. 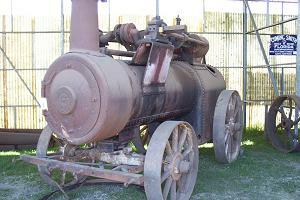 It was kept in a shed during all its working life on a farm near Blayney, NSW. Andrew was told it had been used to run a shearing shed there. Later it went to a flour and chaff mill in the district where the boiler was used to generate steam for steaming chaff. Apart from the cladding sheets having been painted over at some time, the original paintwork is complete and only faded and cracked as one would expect on an engine of this age. A tube brush, firing irons and a copy of the original instruction book and wearing parts manual came with the engine when the Forbes acquired it. At the museum the engine is steamed regularly, at a steam pressure of 90 psi, well within the maximum offered by the boiler inspector. No 17124 The last engine listed in the batch of orders described in the section about No 17119 above. Built under Order No 11096, No 17124 is a 6 NHP Single Cylinder Portable Engine of 8¾" bore x 12" stroke. 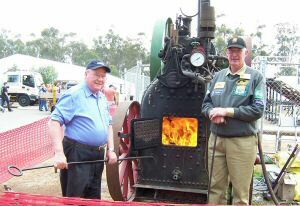 The engine is pictured here in steam at the Gawler Agricultural Show, South Australia on 28th August 2005 with her owner Robert Ahrens (on left) assisted by Tony Fotheringham. 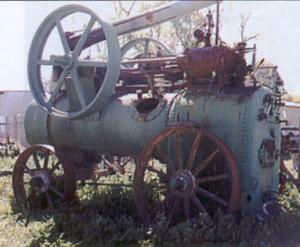 It previously powered a sheep shearing shed in New South Wales. No 17248 A 2½ NHP portable owned by Steve Parrinder's father, in Queensland. (Steve owns No 18457, see below.) 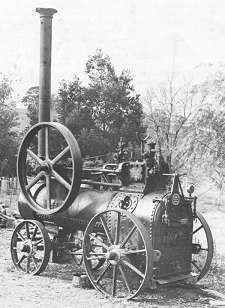 It was one of a batch of six portable steam engines ordered on 19th September 1911 by the Intercolonial Boring Co for delivery to Brisbane. The order was for two 2½ NHP Single Cylinder engines, 5¾" bore x 8½" stroke, three 3 NHP Single Cylinder engines, 6½" bore x 10" stroke and one 5 NHP Single Cylinder engine, 7¾" bore x 12" stroke. All were despatched from Colchester during January 1912, No 17248 being despatched on 19th January. Unfortunately the engine was in very poor condition when acquired by the Parrinder family, having been outside for nearly 60 years. The boiler was burned out and the brass missing. On 31st January 2003 Steven emailed news that his father and uncle had been doing more work on No 17248. The engine had been stripped down and the firebox crown cut out with an oxy-acetylene torch. On 30th January a new plate was inserted but had still to be welded in place. Steven said the Intercolonial Boring Company (IBC) still existed but not under that name. His father has an IBC advertisement of 1950, an image of which is shown below. In September 2013 Steven Parrinder's son, William, emailed to say that this engine is once again steamable and was in steam earlier in the year. No 17251 Like No 17248 above, this was one of the batch of six portable steam engines ordered on 19th September 1911 by the Intercolonial Boring Co of Brisbane. No 17251 is a 3NHP engine which was built under Paxman Order No 11223 and despatched to Brisbane on 5th January 1912. It is now in preservation at the Outback at Isa Centre, Mount Isa, Queensland. The flywheel and crankshaft have been removed but are stored near the engine. As yet, we do not have any further information about the history of the engine or what it was originally used for. 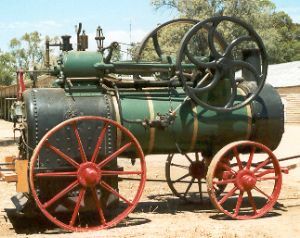 No 17461 A double cylinder portable believed to be owned now by Bob Yonk. 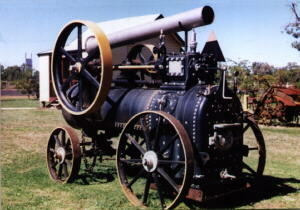 The photograph shown here was taken by Peter Love during his visit to Campbelltown Steam Museum, near Sydney, in Spring 2003. This 14NHP engine was ordered by John Blyth & Co of Sydney on 2nd February 1912 and despatched on 11th April that year. A duplex, rather than compound portable, the bore and stroke of each cylinder is 9¼" x 14". No 17721 A single-cylinder 2½ NHP engine, of 5¾" bore x 8½" stroke, No 17721 was ordered on 12th June 1912 by the Intercolonial Boring Company and despatched to Brisbane on 29th October that year. As at 2015, it is at Herberton Historic Village in Queensland. No 18302 A 12 NHP double cylinder (i.e. duplex) engine with cylinders of 8¾" bore x 12" stroke. No 18302 was built under Paxman Order No 12272 and was one of four portables ordered by John Blyth & Co, entered in Paxman's order book on 2nd June 1913. It was despatched from the Colchester factory on 28th July that year. It carries a 'Moffat Virtue Ltd, Sydney, Sole Agents' plate. Duncan Ray of Atherton, Queensland, purchased No 18302 in December 2018 from the estate of Alf Hardman. 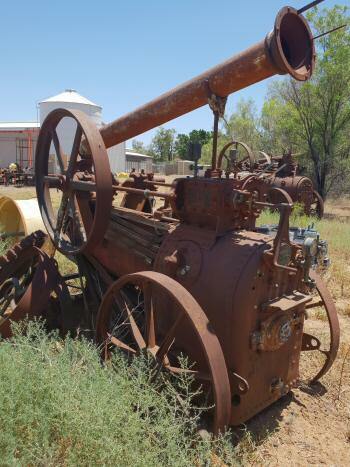 Duncan did some research on the engine's history and found that it had powered a saw mill in Dirranbandi, in the south of Queensland close to the NSW border, up until the early 1980s. A creditable service life for an engine built in 1913. 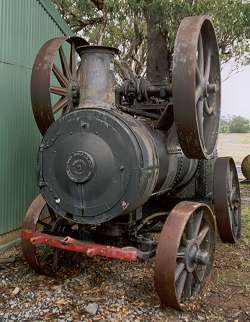 News about the engine had previously been emailed to me by someone who had seen the engine at Moree, NSW, on 15 March 2003. At that time No 18302 was reported to be reasonably complete and in good original condition, requiring mainly repairs/replacement of the smokebox front and drum due to water entering through the uncovered chimney. Boiler condition could not be confirmed as the lagging was still attached which prevented a thorough inspection of all boiler plates but it was clear a full set of boiler tubes would be required. After inspecting the engine in October 2018, with a view to purchasing it, Duncan planned to have the tubes replaced and the smokebox repaired. Apart from that, he confirmed the 2003 report that the engine was reasonably complete as can be seen from the photograph here. No 18455 In October 2002 we received news of this 2½ NHP portable which was originally thought to be 13455 - the correct number being obscured by several layers of paint. It belongs to Incitec Pivot Ltd and is at their Phosphate Hill plant, 150km south of Mt Isa, Queensland. The engine has the Intercolonial Boring Company name on it and, although in fairly poor condition, appears to be basically complete. One 4 NHP Portable - No. 18460. All had a specified working pressure of 120psi. The first engine to be despatched was No 18457, on 12th November 1913. Nos 18458, 18459 and 18462 were sent from the factory on 2nd December, and Nos 18455, 18456, 18460, and 18461 on 18th December 1913. Two other engines from this order have survived, Nos 18457 and 18459, as described lower down this page. No 18455 was allocated order number 12425. It is believed the portable came to Phosphate Hill from Chatsworth station, a local cattle property. As yet we do not know whether the engine was used at Chatsworth and had been there for a long time or if they acquired it more recently from somewhere else. Someone who knows a bit of the history of the area says it was sheep country up to about thirty years ago. Phil Chapman, who contacted us about the engine and provided the photograph, thinks it quite possible the engine was used in a shearing shed. He is trying to track down more about the history of the engine. No 18457 In June 2001 Steve Parrinder emailed us from Queensland. He and his father had just acquired their second Paxman steam portable, the correct number of which was obscured by thick paint. Problems in trying to find and correctly decipher Paxman engine numbers are not uncommon. After establishing it was No 18457, reference to the old Paxman copy order book disclosed this 3 NHP portable was originally part of an order for eight engines for the Intercolonial Boring Company of Brisbane. For full details of the order see the section on No 18455 above. Steve's engine was the first item of the order to be despatched, leaving the Colchester factory on 12th November 1913. The agent's plate, about 10" in diameter, which was originally attached to the smoke box door is missing. No 18457 was purchased to provide parts for portable No 17248 (see above) which is owned by Mr Parrinder's father but, so far, No 18457 appears to be in good condition. 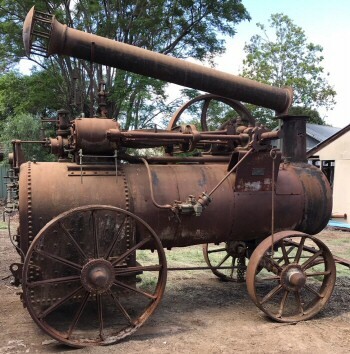 Steven thinks No 18457 was a shearing shed engine and was kept inside a shed until the 1970s when it went to Jondaryan Woolshed Historical Museum. The museum was short of funds so decided to dispose of items in their collection which they could not afford to restore. The Parrinders made a successful offer for the engine and took delivery in early June 2001. It is missing some parts which are unique to Paxman portables. In September 2013 Steven Parrinder's son, William, emailed to say that this engine (as well as the family's engine No 17248 - see above) is once again steamable and was in steam earlier in the year. William reported that very little work was required on No 18457 to get it going again. No 18459 Spotted at the National Road Transport Hall of Fame at Alice Springs by Helena Lindhe while on a visit from the UK in January 2003, this is another 3 NHP engine. With a working pressure of 120 psi, it was part of an order placed by the Intercolonial Boring Company of Brisbane on 1st October 1913. For full details of the order see the section on No 18455 above. This particular portable was despatched from Colchester on 2nd December 1913. 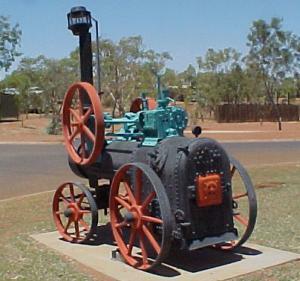 It is believed the engine was at one time used to drive mining equipment at Arltunga, the first settlement of any note in Central Australia. No 18923 The present whereabouts of this portable are unknown and any news would be appreciated. Paxman received a request for information about the engine in June 1997. At that time it was reported to be in good condition and have a current boiler certificate for 100 psi. No 18923 had just been moved to Cootamundra to power a saw bench and perform other light duties. In the past it had been used to drive a gold stamping battery in the Bungendore area near Canberra. This 4 NHP, 7" bore x 12" stroke, engine was ordered on 1st December 1914 by John Blyth & Co of Sydney and despatched a fortnight later on 15th December. The build specification included a flywheel of 4' 6" diameter x 6" wide, a speed of 140 rpm, a Colonial size firebox, and pressure gauge to have red mark at 115 psi. A 'Moffat Virtue Ltd, Sydney, Sole Agents' plate was to be attached and 'special greased paper' used for packing. No 19530 In March 2002 Steve Parrinder sent a photograph of this portable he had 'stumbled across', but then the number and location of the engine were unknown. An appeal on this page for information resulted in an email from John Uden on 30th May 2002. John and his son Andrew had purchased the engine a year earlier, around May 2001. It had previously been owned for eight years by someone from Colyton, Sydney. The Paxman order book confirms that No 19530 is a 4 NHP portable with a single cylinder of 7" bore x 12" stroke. It was one of three portables ordered by John Blyth & Co on 18th January 1916. The other two were No 19529 rated at 3 NHP, and No 19531 rated at 6 NHP. All three were dispatched from the factory on 6th March 1917. It is of interest to note this order was fulfilled in the middle of World War 1 when Paxman was very busy with war work which, no doubt, accounts for the long delivery time. No 19530 carries a Moffat Virtue agent's plate and spent its early days in the Molong area, about 350 kilometers west of Sydney. John says the engine is complete and has a steam ticket for 50 psi. He and Andrew have steamed it twice, at the Campbelltown Steam and Machinery Museum Rallies on 1st October 2001 and 2nd May 2002. More details of the portable's history arrived during January 2003 in emails from Arthur Hopkinson who had recognised the picture originally sent by Steve Parrinder. Hardly surprising, as Arthur himself had taken the photograph when he owned No 19530. 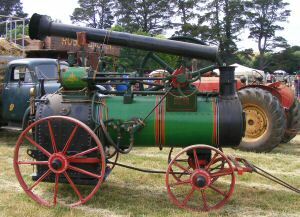 He bought the engine from someone in the Box Hill area of western Sydney who was a member of the steam museum at Picton. The engine was complete when purchased. The piston and connecting rod had been removed but were in a box together with all the brass plates, etc. The brass work is usually missing from old portables. Arthur repainted the engine in its earlier colours, the cladding sheets being a dark apple green and the flywheel a dirty grey to black colour. These seem to match the colours described by Dave Macloy on his engine. In his emails Arthur related his first experience of firing up the portable. Seven years previously spent as a fireman and shunter for the Staveley Iron and Chemical Company stood him in good stead for the task. The engine was first taken to his home at St Marys where the steel cladding was removed, the asbestos tidied up, and the wood lagging stored away. Having plugged all the holes to the boiler, it was pumped up to 65 lbs from the water tap and held for one hour without any leaks. The piston and rod were fitted, the safety valve set to 25 lbs, and a small fire lit in the boiler. Starting with a full glass (i.e. the boiler full), it took about one hour to make steam. Arthur then let the engine run slowly until the water level reached about a quarter of a glass, at which stage he threw out the fire. The reason for this was that he could not get the water pump and injector to work - it was seized solid. Afterwards the water pump and injector were taken off the boiler, put in a tranformer drying oven overnight and then into a drum of transformer oil. When cold he tried moving the handles which remained solid so the process was repeated. At the third attempt the handles did move but when put back on the boiler the pump still would not work. Arthur did eventually manage to dismantle and re-assemble the pump but even then it would not function so things were put in abeyance until the part could be repaired or replaced. Arthur sold the engine about ten years ago to Mr Hart, a neighbour's father. Again it was sold complete, together with spare tubes, tube expander and various other bits including all the brass plates and screws. 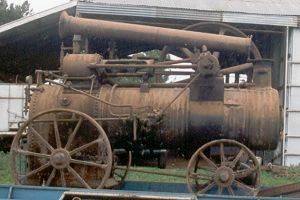 The photograph shown here was taken in Spring 2003 by Peter Love when visiting the Campbelltown Steam Museum, near Sydney. Peter reports that the condition of the firebox stays and boiler are not good, with four of the boiler tubes being blocked off. However the wheels and small parts are in excellent condition. No 19584 A 4 NHP Portable owned by Mr Graham Clegg of Maimuru, NSW, since about 1981. Paxman records show that John Blyth & Co placed the order for this 7" bore x 12" engine on 10th March 1917. It was shipped out to Sydney on 26th April that year. About twenty years ago Graham was told the engine was originally built as No 15682, and despatched in 1910 with a show finish to Lagos, Nigeria for an agricultural show or exhibition. Returned to the Colchester works via mainland Europe, it was renumbered 19584 in 1917 and sent out to John Blyth & Co in Australia for Moffat Virtue, who were major suppliers of sheep shearing plant. He says traces of the original number can still be seen on the end of the crankshaft. It was only partly, and roughly, filed off before the new number was stamped on. There is no comment about this in the old Paxman order book but it does look as if No 15682 was a 4 NHP portable despatched to Lagos in October 1910. Graham acquired the engine from a farm in central NSW where it had spent all its life chaff cutting and driving the woolshed. It was 100% complete, including fire irons. The only work necessary has been to re-tube the boiler - trying to find 2¾" tubes in Australia was a challenge - and carry out a general mechanical refit plus tidy up. The engine has not been repainted so retains its original working appearance. Not much paint survives but the boiler lagging is definitely mid-green, the crankshaft brackets a dark red oxide colour, crankshaft bearing housings mid-green, the wheels and front axle light red. For several years Graham regularly used it to drive a firewood sawbench before replacing it with an 1881 Brown & May for the job. The portable now makes an annual appearance at the local steam gathering where it usually drives a 110 volt generator to provide some lighting.